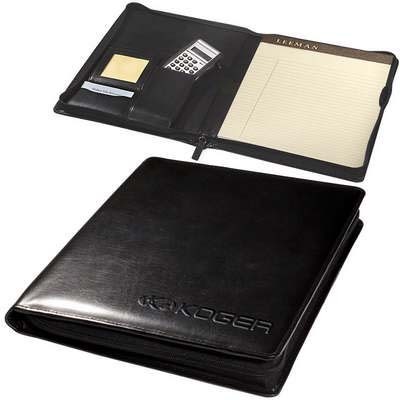 Zippered Leather Magnetic Photo Portfolio is a must-have in the corporate world. Opening to reveal an internal magnetic frame for 2-1/2" x 2-1/2" photo, this stylish portfolio is a suitable gift for both men and women. It is made of cowhide leather with 1680d nylon and faux suede lining which gives it a sophisticated look. The chic portfolio is designed with separate pockets for business cards, cell phone and documents. It also includes a 8-1/2" x 11" ruled pad. Show off with confidence your logo that we will neatly imprint on this sophisticated portfolio and give a fillip to all your promotional activities.